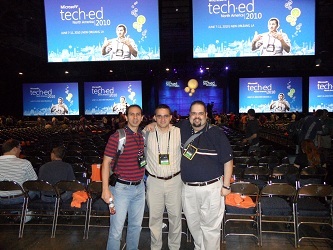 Well folks, after a brief hiatus in updating, I’m back with some interesting tidbits from my experience in TechEd/BI North America 2010. 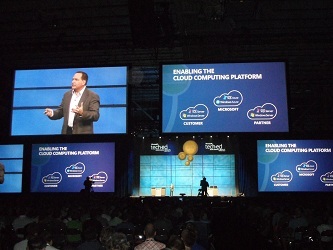 TechEd/BI took place in beautiful New Orleans, Louisiana, on the Ernest N. Morial Convention Center from June 7th to the 10th. 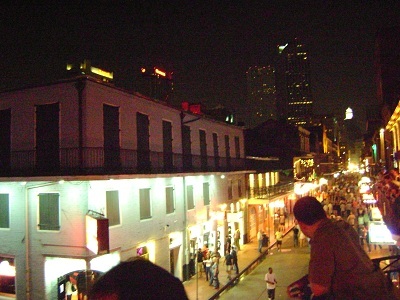 It was my first trip to New Orleans and to the TechEd/BI to tell you the truth. I went with my good buddies and co-workers Carlos Bercero and Alan Koo. Microsoft did an outstanding job on accommodations and transportation to the event. Tour buses which were arranged by routes from the hotels to the convention center on specifics times (there only caveat was that from 11:00 to 4:00, there were no buses, so if you needed to get back to the hotel, it was either taxi or a 20 minute walk, depending on your hotel). 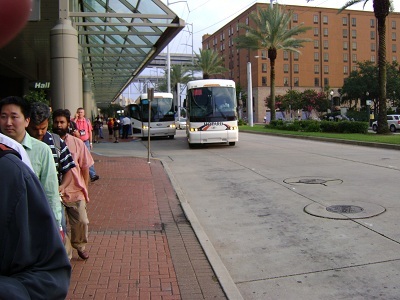 We stayed at Mariott Canal Street, which was pretty close to the convention center. We got a decent rate ($199) and the room was comfortable (thou imagine three people staying on a room; tight, but comfortable enough). But enough about minor details; you’re here for the good stuff. And I’ll try to give you my walk-through of the event. Upon arriving to the sea of people on the outer halls of the convention center, we wandered and merged into the current of techies flowing into the registration hall. There were quite a few lines for registration and all were full. All expect two tiny lines which had no more than 6 people. Curiosity got the better of my friend Carlos and he dashed away to see if he could get registered there. Upon arriving to the line, we were informed that the line which we were, was the BI line. The other lines were for TechEd people only. Seems that the BI conference and the TechEd conference were merged into the TechEd/BI conference. Interestingly enough, both Carlos and I were registered as BI, while Alan was TechEd. Sorry Alan! After getting our swag (nice blue messenger bags, while TechEd got grey/green backpacks), we noticed that our badges were yellow, while Alan’s was black. Pay attention to this detail, it’ll come up later in the story. In all badges, there was a mini-conference map, which gave th names of the different sessions, times and rooms where they would be given. 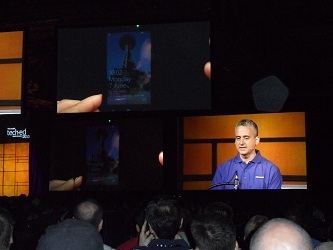 Now for the KeyNote. The KeyNote was a great motivator speech. Don’t get me wrong, it wasn’t a sugar-coated speech like most motivational talks are, but it got you excited on all the technology that we were going to be seeing for the next four days. Cases in point: Visual Studios 2010. Specifically, IntelliTrace. This new feature (only on Ultimate) allows you to, while you’re debugging, to collect data about a managed application in the background, including information from many framework components such as ADO.NET, ASP.NET and System.XML. These IntelliTrace events allow the developer to see what has previously occurred during execution, and most importantly, to “step back in time” to see prior states of the application without having to restart the debugger. Another case in point: Windows Azure in the Cloud. Yes, those mystical words that Microsoft has been talking about for quite some time now. For those of you wondering: Windows Azure™ is a cloud services operating system that serves as the development, service hosting and service management environment for the Windows Azure platform. Windows Azure provides developers with on-demand compute and storage to host, scale, and manage web applications on the internet through Microsoft® datacenters. Still to come: The Avatar plug and the Chicago Tribune plug. I’ll spare you those minutes which I’ll never have back. Unified Communications: Strong platform with cool features, but what got my attention was the 720p resolution video out of the box. Windows 7 Phone: Now THIS was a great topic. This OS will give the iPhone a run for its’ money. The UI is smooth and pleasant to look at. Also, the integration with Office, Sharepoint and Exchange is so seamless, that collaboration on documents (in real time) using your phone is well, amazing! Instead of repeating stuff (as I did before), check out this article. You can check it out, I’ll still be here. Codename: Dallas. 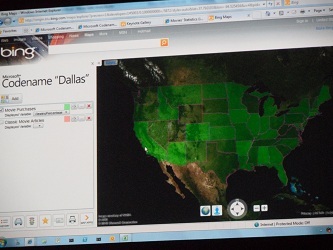 This was a most interesting demo showing Bing Maps and Silverlight coding. Check out the Keynote; It’s better to see it than read of it. After the KeyNote, we decided to check out the Expo and have lunch. I don’t remember what I had for lunch, but I do remember that it wasn’t a memorable one, or a satisfying one at that. If you have read my blogs before, or know me for that matter, then you should know that PerformancePoint (Planning to be precise) is one of my strong points. So I decided to attend this session. The speaker was Josh Zimmerman, which from his performance on this session and the recommendations he later gave, told me that he knew his stuff and wasn’t a know-it-all. He began with a quick survey of audience knowledge and Kerberos errors (which immediately got my attention). One of his key points was pointing out how PerformancePoint changed from being installed on a specific web application and had to be on a specific site. This time around, it became a shared service, so it could be used by different web sites and not be tied to another web app for resources. Also, learned that Secure Store is Single Sign On – the next generation. The only drawback from this session was that the demo broke down, due to the whole convention center network going down. Still, it gave me a good sense of the changes (Unattended Account vs Application Pool), and security (Claims, instead of Kerberos). Be careful with Titles versus content. I came to the session expecting something, and got something unexpected. It talked about authoring techniques which I already knew (from experience) and it felt not as an advanced session, but an intermediate. Then came the new features, which sparked interest, but it was really overview, and since I was going to be looking into it on the next session, it became tedious. If you want to see it, follow the link. Now, this session was a very informative one, since I didn’t know the new features. First, the speaker Peter Myers is a very charismatic speaker. Second, the features were explained perfectly. For example, Sharepoint lists can be used as data sources and that we can now (finally!) do aggregations of aggregations in Reporting Services (sample: Avg(Sum(Field.MyField.Value)). Also, the Lookup feature. Lookups help you bring information from different datasets into the main dataset. Imagine using a Join between two datasets. That alone is a great feature. And of course, let’s not forget Maps, Rendering specifics for Output ( you can actually specify how the excel export is going to look like (and naming the sheet! ), dynamic page breaking, bottom to top text rotation (imagine 270 degrees text) and Atom Feeds. Watch this session! Continuing the madness, we regrouped to enter the trenches of product placements, booth girls, food, booze, prizes and general swag. After stuffing ourselves with food and beverages, we walked around and tested the waters. Microsoft was smart in the way the splitted the Expo into three cubes of interest. Cube Yellow was BI, Cloud, Database, Office, UN (Unified Comm), and Windows Phone. Cube Red was Management, Security, Windows Embedded, Virtualization, Windows Client and Windows Server. Cube Blue was Architecture, Application Server, Development, Web Platforms. Alongside said cubes, were the partners which were related to said cubes. It ranged from sharepoint integration, and visualization, to learning centers, development tools, backup and restore, security (all aspects) to desktop integration and cloud computing. We walked and looked and took some of the better stuff home. 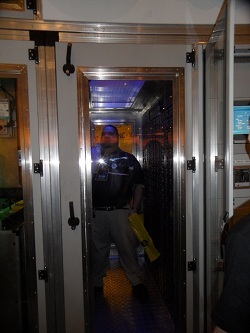 I got inside a freakishly large portable freezer, for implementing mobile data centers.